I just learned a nifty workaround to make EPiServer Composer Global Blocks work with EPiServer Commerce. The core issue is that Composer has EN as the default language while Commerce has EN-US as the default language. Here is what you need to do for those two to work together. Still in the language settings, set the fallback language to English (United States) > English. Minimize the root folder and then expand it again, so that the page tree is updated with the changes. A flag should appear left most of the Extension data container. 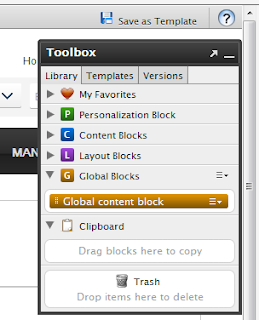 Now you should be able to create Global content blocks on your site! To finish up, don't forget to restore the hideDataContainer value to true in web.config.